Home » Connectivity » Webnames unveils free students hosting package. Can they be trusted this time? Sometime last year we wrote about Webnames, a new online domain registry service that had entered the market with the cheapest service. These were the guys behind hosting service uHostAfrica. With services priced at $5 for each domain, Webnames gave existing providers like Google and name.co.zw a run for their money. We even saw promotions from name.co.zw which looked like they were partly influenced by the presence of this new competitor. Now that it’s a new year it looks like Webnames is back again, only this time it’s with a free web hosting package for students. It is being extended to students because it is meant to help young entrepreneurs in marketing their products. Beyond all these frills this sounds like an awesome initiative to get a lot of young people to explore the opportunities that come with having an online presence. Its a positive way to allow for the development of tech entrepreneurship in the younger generation. There is, after all, a lot that can be explored in terms of startups and online businesses that comes from being an active part of the internet. However most people familiar with Webnames are probably wondering if these guys can be trusted this time around. We got a lot of unsavoury feedback from users who had bought domains from Webnames and were less than impressed with their service. There were complaints about domains that were paid for and never registered, silence from the domain registration startup when issues were raised via email, and shortage of contact details when customers wanted to raise issues to do with service. All this painted the impression that this startup has been operating in a dishonest way. What most customers would probably want to know is If the quality of service was questionable last year (when it was being paid for) will it be any better this time around, even more so when its free? According to Munyaradzi Mtake, the team lead at Webnames, a lot of the challenges they were encountering last year have been rectified with an improved customer response system. Towards the end of the year they updated their systems, something highlighted in an announcement on their website. I think there is a lesson to be learnt here for any startups, especially the students that are meant to be roped into tech entrepreneurship by this new Webnames offer. Good startup solutions that solve a pain in the market are always welcome in the environment and Webnames has come in to do that. However, a startup has to respond to customer feedback and deliver on promises. Impressions matter a lot in business, especially startups. It doesn’t matter how great the solution or initiative is, honesty and responsiveness are crucial. With web hosting you get what you pay for..
@Anthony the HTTPS is being worked on already and is a high priority. With regards to US and UK servers we actually have both. Why dont you give us a try and then we take it from there? And with regards to ZOL you need to have an active broadband service with them. With us you do not need to have anything, you can register your domain elsewhere and so long as you prove that you are a student by providing a scanned copy of your student ID the service is registered for you. Thank you for the feedback that you ave given us. We have been listening to feedback coming from clients that did not receive satisfactory services from us and we have listened which is why we are constantly working on improving the entire service not just on the domain registration part but also on the web hosting side of things. On average response time for customer support tickets has gone from 2 days to 10 minutes -2 hours and we have incorporated live chat into our platform to help clients with all the steps when they are registering a domain or they want to ask questions. I bought a domain for a client on webnames and boy I regretted that move big time. I already had 10 domains with name.co.zw but lured by the cheaper prices. One lesson I learned, cheap is expensive and I sheepishly went back to name.co.zw. cause their service is beyond excellent. Will just keep using my older domain registrer. Hi, could you please email the domain names or provide us your name and we can look into this issue for you. We apologize for the inconveniences caused . Registered for a domain and hosting with webnames – they DIDN’T deliver ANYTHING! Luckily pay4app refunded me my money and I went with names.co.zw and Godaddy – but annoyingly I STILL get billing e-mails from them. So I’ll add my voice to the chorus of complaints and discontent. PLEASE SORT YOUR STUFF OUT! Hi ADM.. Please send an email to sales@webnames.co.zw with your details and we will contact you. Honesty is the web’s currency. There’s no shortcuts to success. Startups have to deliver on their promise. From reading the comments in this section i can say webnames are learning (or have learnt) the hard way. To be fair to them, i recently helped a young entrepreneur register a domain with webnames and they seemed quite responsive and i must admit i was pleasantly surprised. That first impression counts. It’s however going to take more effort on their part to win back the trust of the likes of @frank, @refunf and @adm. But i do applaud their efforts in responding to the disgruntled customers. Well.. actions speak louder. Taking the feedback from actual clients as actual reviews, they definitely need to clean up their service. Checked checked this name.co.zw website and its no way to be found online. Their account has been suspended. 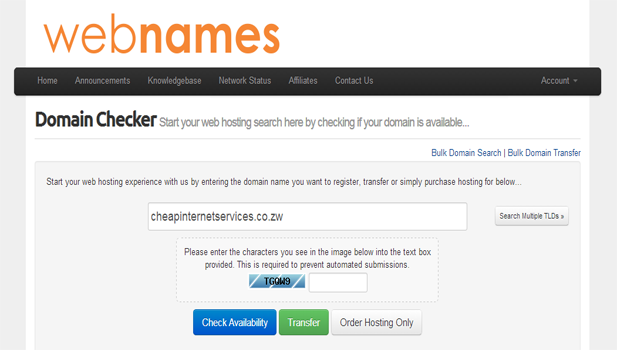 I have also realised that it seems like its a hostgator or some SA hosting company. https://www.name.co.zw has never been suspended and is always online. I think you meant http://www.webnames.co.zw. They are the ones that were once suspended but are now back online. https://www.name.co.zw/ has never been suspended and is always online. I think you meant http://www.webnames.co.zw/ They are the ones that we once suspended (http://answers.techzim.co.zw/18131/why-is-webnames-co-zw-down-its-been-almost-two-weeks-now) but they are back online now. They are the subject of this article. Hi Nya B, it seems you have mistaken name.co.zw with another website. Name.co.zw never got suspended. Also it has nothing to do with hostgator and any SA company, it was developed locally and it’s always online. If you want to be taken seriously, do simple professional things like having phones that get answered or available. Its frustrating to have to look for numbers across the internet only to call a team lead who sounds as if he has no clue to what he is doing. FatCow provides Web Hosting for small businesses & individuals. Whether you’re looking for a domain or complete web solution, FatCow’s got it! Domain Registration, Cloud and Virtual Private Servers. Stop telling us sweet nothings and refund us the money you swindled us. I have been complaining for 6 months and I am tired of sending emails, posting support tickets, complaining on your Facebook page and complaining here on Techzim. And what promise have you ever fulfilled? Not even one! Webdev is also not right says 100% uptime but most of the time my site is down. Wanna hear some free advice, I don’t think it’s a good idea to use local domain registrars and hosting. It’s not like we hate you guys but come on you charge me eight bucks and offer me service which can be surpassed by many free hosting companies.